If you're looking to while away a ridiculous number of hours on your favorite movie trilogy, you are very much in luck. 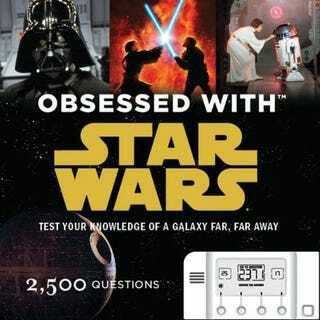 This Wednesday, Chronicle Books releases the 2500-question trivia game book Obsessed with Star Wars, which should nestle quite nicely in between companion volumes Obsessed with Hollywood, Obsessed with Golf, and Obsessed with Baseball. Seriously, though - author Benjamin Harper means business, so you'd better have read more than a few tie-in novels. There's no arguing with the batteries-included automatic scorepad, and its insistent beeps will have you addicted before long.Like any trivia book, this one has its problems; for example, I'm pretty sure it was Han Solo who whined about "delusions of grandeur" and not C-3PO as the book attests, and my dad swears that C-3PO was more afraid of stormtroopers than any rude protocol droid. Then again, however, maybe you shouldn't be taking the word of someone who got only 21 questions correct out of a randomly selected 40 — especially when three of those questions were repeated. I'd like to request a better randomizer program if you ever get to Obsessed with Star Trek, please, Chronicle. The game, however, is sweet, and I don't mean that in a teenaged-exclamation way. It rounded up my percentage of correct answers to 53%. I'm off to flip to the Empire Strikes Back chapter and beef up my score even more. Obsessed with Star Wars Image from Amazon.